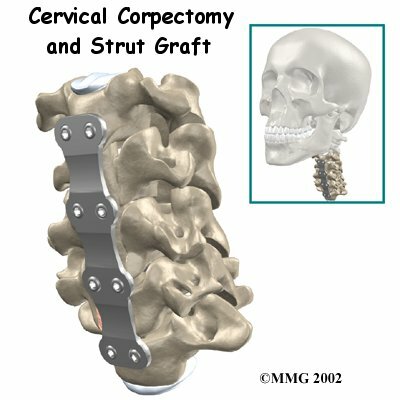 Welcome to Grapevine Physical Therapy & Sports Medicine's patient resource about Cervical Corpectomy and Strut Graft. The surgeon carefully cuts part of the anterior longitudinal ligament away from the front section of the spinal column. 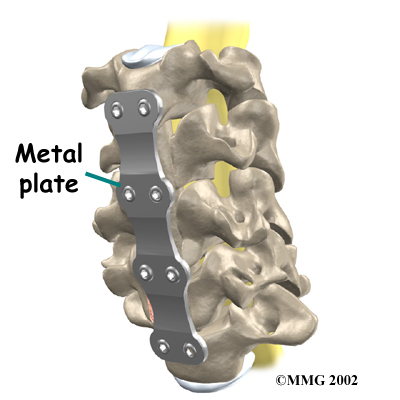 Instruments are then used to take out the front half of the discs that lie between the vertebral bodies. 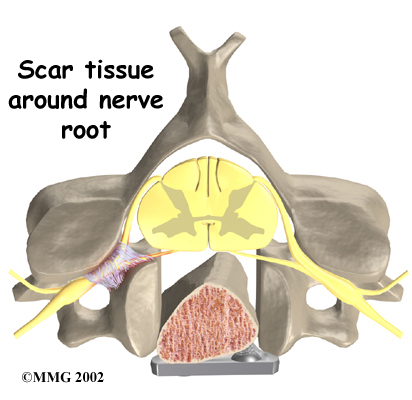 Next, a small rotary cutting tool (a burr) is used to carefully remove the back half of the discs (called discectomy) and a row of vertebral bodies (called corpectomy). 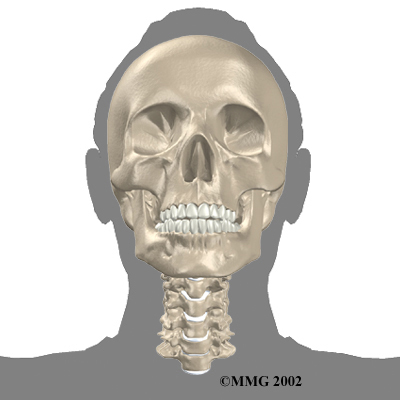 The ring of bone that surrounds and protects the spinal column isn't touched. 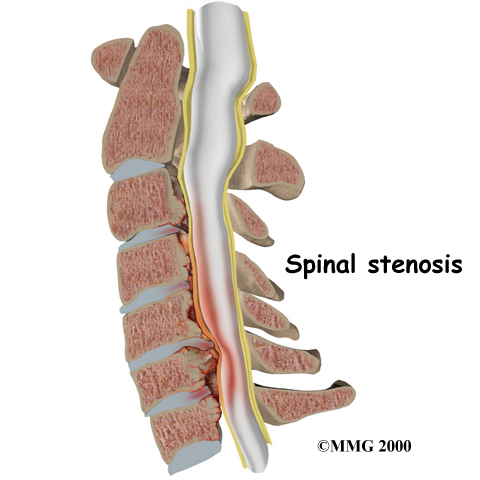 Infection following spine surgery is rare but can be a very serious complication. Some infections may show up very early, even before you leave the hospital. Infections on the skin's surface usually go away with antibiotics. 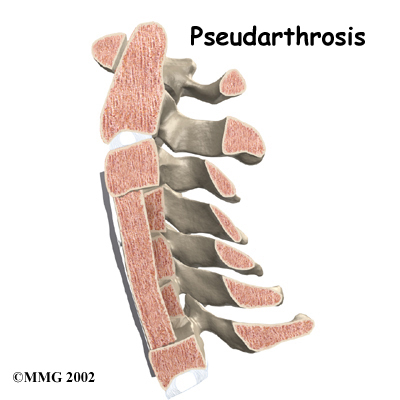 Deeper infections that spread into the bones and soft tissues of the spine are harder to treat and may require additional surgery to treat the infected portion of the spine. 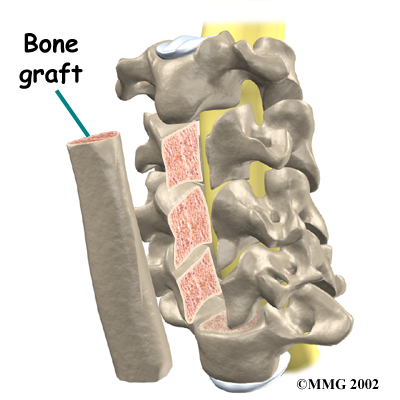 Your surgeon may give you antibiotics before spine surgery when the procedure requires bone grafts or hardware (plates, rods, or screws). 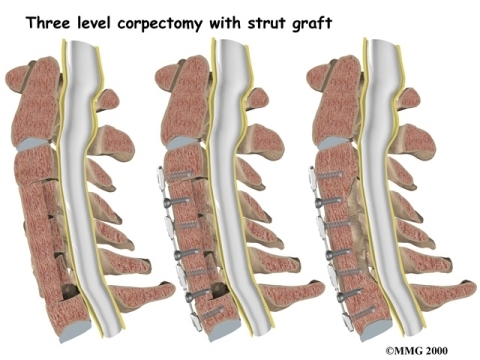 Rehabilitation after corpectomy surgery can be a slow process. Although the time required for recovery varies, you will probably need to attend your Physical Therapy sessions at Grapevine Physical Therapy & Sports Medicine for two to three months, and you should expect full recovery to take up to one year. At first, our treatments are used to help control pain and inflammation. Our Physical Therapist may use ice and electrical stimulation treatments, massage and other hands-on treatments to ease muscle spasm and pain. Our Physical Therapist will also work with you on how to move and do activities. This form of treatment, called body mechanics, is used to help you develop new movement habits. This training helps you keep your neck in safe positions as you go about your work and daily activities. At first, this may be as simple as helping you learn how to move safely and easily in and out of bed, how to get dressed and undressed, and how to do some of your routine activities. Then we'll teach you how to keep your neck safe while you lift and carry items and as you begin to do other heavier activities. As your condition improves, we will tailor your program to help prepare you to go back to work. Some patients are not able to go back to a previous job that requires heavy and strenuous tasks. 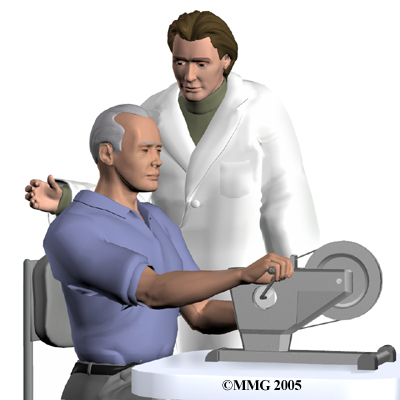 Our Physical Therapist may suggest changes in job tasks that enable you to go back to your previous job. You'll learn new ways to do these tasks to keep your neck safe and free of extra strain.